Audi will be presenting the A3 clubsport quattro concept at the 2014 Wörthersee Meeting in Reifnitz (Kärnten). 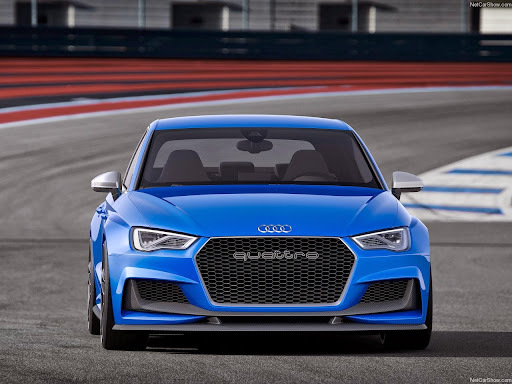 The concept study is based on the S3 Sedan and has a five-cylinder TFSI engine under the hood producing 386 kW (525 hp). "The Audi A3 clubsport quattro concept shows our car and tuning fans at the Wörthersee just how much sporty potential there is in the A3 family and in our top-of-the-line engines such as the 2.5 TFSI. We have pushed the limits in every respect with this show car: power, dynamics, sound, design," says Prof. Dr. Ulrich Hackenberg, Member of the Board of Management for Technical Development. Based on the S3 Sedan, the show car is equipped with a powerful five-cylinder TFSI engine. The turbocharged engine with direct injection in the show car boasts an impressive success story. Since 2010, an expert jury has already voted it "International Engine of the Year" in its category four times in succession. The 2.5 TFSI powers the production Audi RS Q3. In the show car, the 2,480 cc five-cylinder produces 386 kW (525 hp) for a specific output of 155.6 kW (211.7 hp) per liter. With a total weight of 1,527 kilograms (3,366.5 lb), this corresponds to a power-to-weight ratio of 2.9 kilograms (6.4 lb)/hp. Maximum torque of 600 Nm (442.5 lb-ft) is available between 2,300 and 6,000 rpm. The Audi A3 clubsport quattro concept accelerates from 0 to 100 km/h (62.1 mph) in 3.6 seconds and reaches a top speed of 310 km/h (192.6 mph).